We have issued an updated research report on Kennametal Inc. KMT on Sep 10. This industrial tool maker currently has market capitalization of approximately $3.4 billion. Presently, it carries a Zacks Rank #3 (Hold). Few growth drivers, as well as certain headwinds, which might influence Kennametal, have been discussed below. Financial Performance & Outlook, Share Price Performance: In the last four quarters, Kennametal pulled-off a positive average earnings surprise of 11.21%. This includes the impact of 6.10% earnings beat recorded in the fourth quarter of fiscal 2018 (ended Jun 30, 2018). It’s worth noting here that the company’s bottom line increased 55.4% year over year. On a segmental basis, year-over-year sales growth of 16.3% was recorded for Industrial, 12.4% for WIDIA and 12.1% for Infrastructure. For fiscal 2018, the company anticipates gaining from strengthening end-market demand and initiatives. Pricing actions will likely negate the impact of higher raw material costs. Adjusted earnings are predicted to be $2.90-$3.20, above $2.65 recorded in fiscal 2018. Organic sales growth will be 5-8%. Sentiments currently seem to be favoring Kennametal. In the past 60 days, earnings estimates on the stock for the first quarter (ending September 2018) and fiscal 2019 (ending June 2019) have been revised upward. Currently, the Zacks Consensus Estimate for earnings is at 64 cents for the first quarter and $3.14 for fiscal 2019, reflecting growth of 6.7% and 3% from the respective tallies 60 days ago. Estimates for fiscal 2020 (ending June 2020) remained stable at $3.54. Further, the company’s share price has increased 8.7% in the past three months against 0.1% decline of the industry. 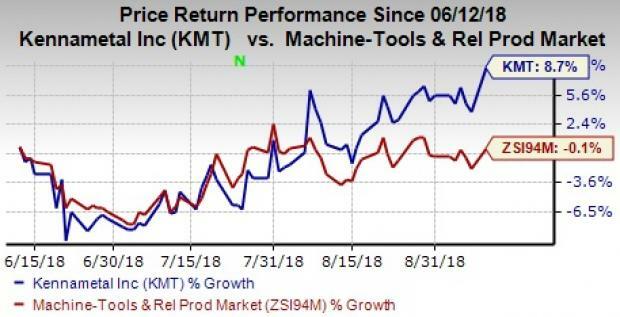 Tactical Initiatives: Restructuring initiatives, including headcount reduction and other miscellaneous programs, have been beneficial for Kennametal. These programs, largely completed in the first quarter of fiscal 2018, yielded pre-tax savings of $4 million in the fourth quarter of fiscal 2018. Another $10 million in pre-tax savings are predicted for the first half of fiscal 2019 (ending December 2018). In addition to this, the company works on its three initiatives — growth, modernization and simplification. Sales improvement through commercial execution is being achieved through growth initiative while the simplification initiative is helping in improving operational efficiency and reducing costs. In early stages, the modernization initiative will start yielding benefits later. Solid Business Structure: Kennametal, through its three reporting segments, caters to the demand of its customers in end markets, including farm machinery, highway construction, machine tools, coal mining, aerospace, oil and gas exploration, automotive, and quarrying. Strengthening end-market demand will be a boon for segmental businesses. In three fiscals (2019-2021), Industrial sales are anticipated to grow 2-4% (CAGR) while WIDIA sales are expected to grow 9-11% and Infrastructure sales are likely to expand 3-5%. Further, the company has operations in the Americas, the Asia Pacific, and Europe, Middle East and Africa (EMEA). Such business diversity is a boon for Kennametal as weakness in any end-market/geographical location can be offset by gains in others. Forex Woes, Weak Top-line Outlook: Despite reflective of a flourishing business, geographical diversification has exposed Kennametal to headwinds, arising from geopolitical issues and unfavorable movements in foreign currencies. For fiscal 2019, it predicts unfavorable foreign currency translations to have an adverse impact on its top line. It’s worth noting here that the company estimates organic sales of 5-8% in fiscal 2019, way below 12% growth registered in fiscal 2018. Surging Costs and Weak Margins: Kennametal is grappling with adverse impacts of rising cost of products sold and operating expenses. In the fourth quarter of fiscal 2018, cost of goods sold increased 7.2% year over year while operating expenses expanded 12.1%. On the other hand, earnings in fiscal 2018 were adversely impacted to the tune of 38 cents per share by higher sales incentive and management expenses, salary inflation, and overtime and temporary help costs. For fiscal 2019, raw material inflation will be an issue. However, pricing actions are predicted to bring in some relief. Huge Debts Raise Concerns: Kennametal’s long-term debt balance of $592 million at the end of fourth-quarter fiscal 2018 represents 15% decline from the last-reported quarter. Despite the respite from the fall, we believe that fresh issuance in the quarters ahead is bound to increase this balance. In the fourth quarter of fiscal 2018, the company issued $300 million of senior unsecured notes while its borrowing capacity under its revolving currency facility was increased by $100 million to $700 million. We believe, if unchecked, high-debt levels can increase its financial obligations and prove detrimental to its profitability in the quarters ahead. Some better-ranked stocks worth considering in the Zacks Industrial Products sector are Colfax Corporation CFX, Chart Industries, Inc. GTLS and Barnes Group Inc. B. While Colfax sports a Zacks Rank #1 (Strong Buy), both Chart Industries and Barnes Group carry a Zacks Rank #2 (Buy). You can see the complete list of today’s Zacks #1 Rank stocks here.